This widget will display topics that contain similar keywords based on the topic you're currently viewing. This widget should work on any forum version. To install this widget go to Modules > Forum widgets management and create a new widget with the following settings. When everything is setup correctly make sure to click "save" and drag the completed widget into the column you want it to show. 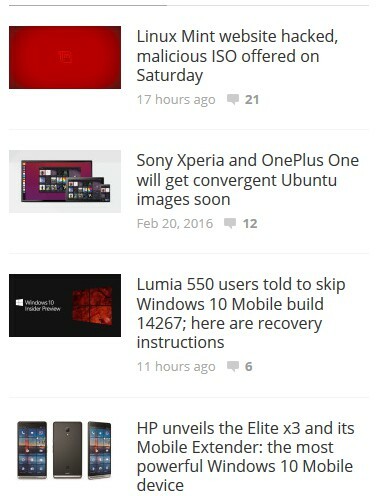 After that the widget will show up while you're viewing a topic if there are any topics similar to it. 1. The widget will only show up while viewing topics and if there are any topics similar to it, otherwise it will remain hidden. 2. The topics are found by performing a search of the topic title keywords, and show the most recently updated topics. and changing the "5" to any number you want. If there are any problems or questions feel free to leave a response below. Enjoy ! What will appear while looking at the index/homepage? @SLGray wrote: What will appear while looking at the index/homepage? I set a condition in place which will hide the widget when you're not viewing a topic. That is amazing. Thanks for sharing this tutorial. In template (html) not working. They can be added and the image of the subject? @ddr3 wrote: In template (html) not working. Which template are you adding it to ? @ddr3 wrote: They can be added and the image of the subject? I'm sorry, I did not comprehend. Could you try to explain this better ? I see what you mean. It's possible, however it'll require an unnecessary amount of AJAX to get the images for each topic. As for the template, I'm not sure why it isn't working. I'll have to look into it. Check to see what you can do. I notice that the topic you are viewing is included in the similar topics widget. Is there a way to stop that? @SLGray wrote: I notice that the topic you are viewing is included in the similar topics widget. Is there a way to stop that? I didn't think about that ! The topic is still appearing in the widget. @SLGray wrote: The topic is still appearing in the widget. Thanks for taking the time to give me the coding. Perfect ! I'll update the code in the first post. No problem, thanks for letting me know of this. 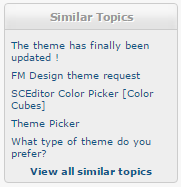 I want to show "Similar topics" under topic, above "Quick reply".